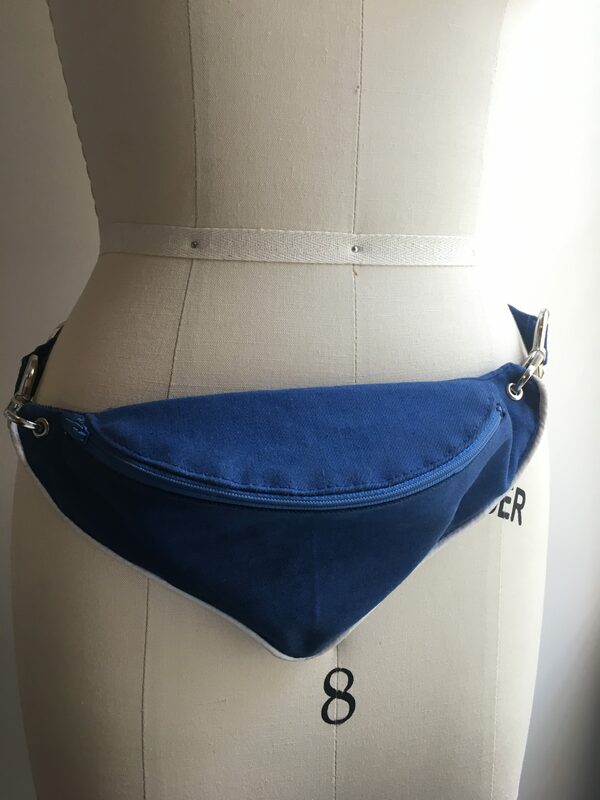 My latest Garment Designer project (if you couldn’t tell from the title) is a fanny pack! 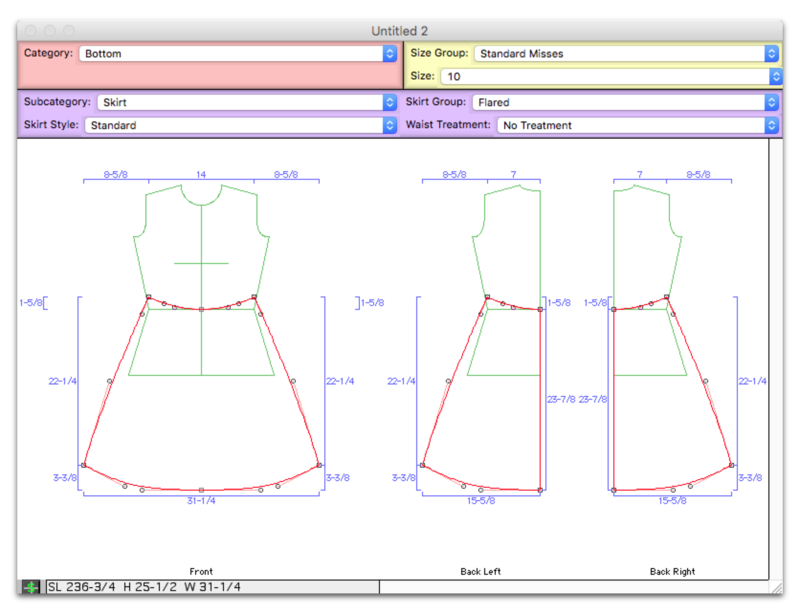 I needed to make a quick pattern and I wanted it to be big enough to fit cash/cards and a phone so I used my dress form to gauge how wide and tall it would be. The pattern is relatively simple with 1) outer portion of the pouch 1) back piece and 1) top piece (semi circular piece). I made sure to interface everything and I am still wondering whether a cute lining was in order… but I was on a time-limit and a mission! 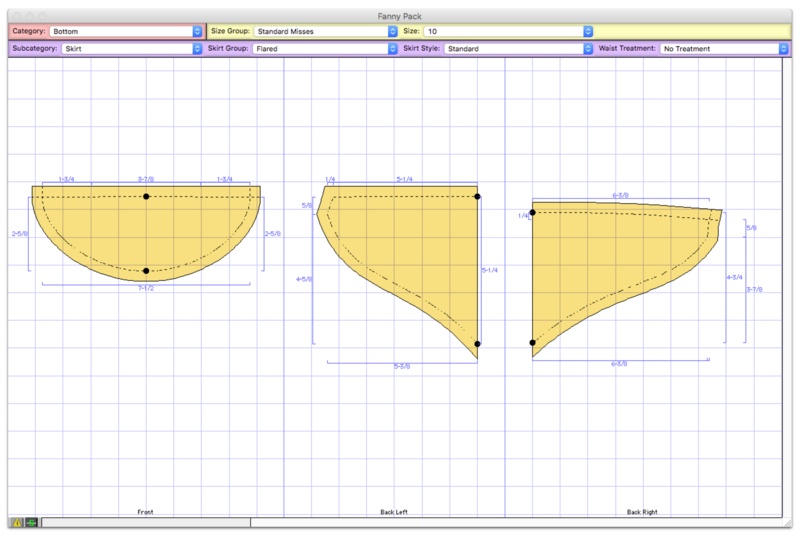 If you ever want to test your Garment Designer skills, making a shape from a style set is challenging but fun! 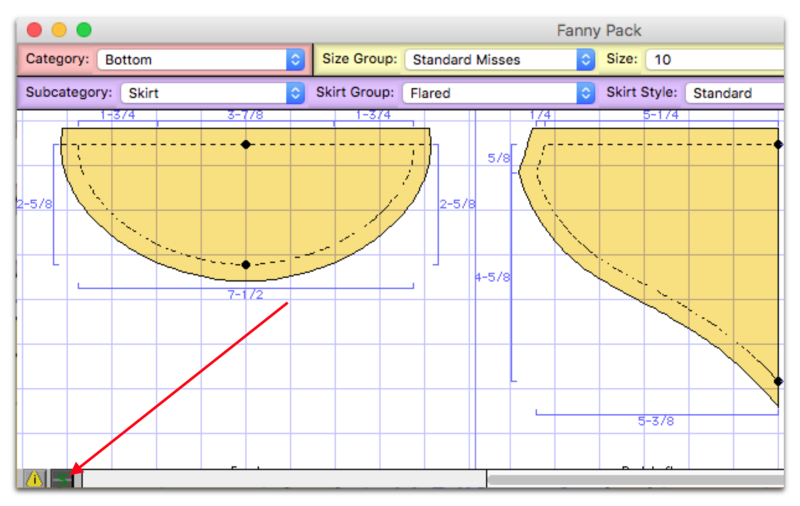 I went through the different skirts and tops to try to find a style I could make my fanny pack pattern shapes from easiest and the winner was the flared skirt pattern. I chose this style since every point had a bezier curve I could use. 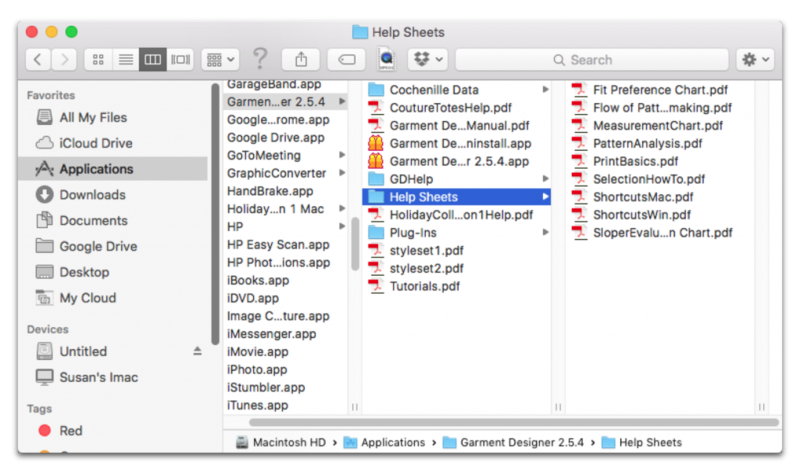 I had the front of the skirt pieces displayed as joined (mac keyboard shortcut: click inside the pattern to highlight all and type ‘j’) and the back skirt displayed as independent (click inside the pattern to highlight all and type ‘i’). This way I could have all my pattern pieces displayed at once. The top of the pouch being the front of the skirt and the back and front of pouch being ‘cut on fold’ as the back pieces. I made the top of my pouch pattern first by manipulating the points to my predetermined measurements. Then I drafted the very back of my fanny pack pattern. Mind you I still had left/right symmetry on so they were symmetrical…but I forgot to take a picture, sorry! 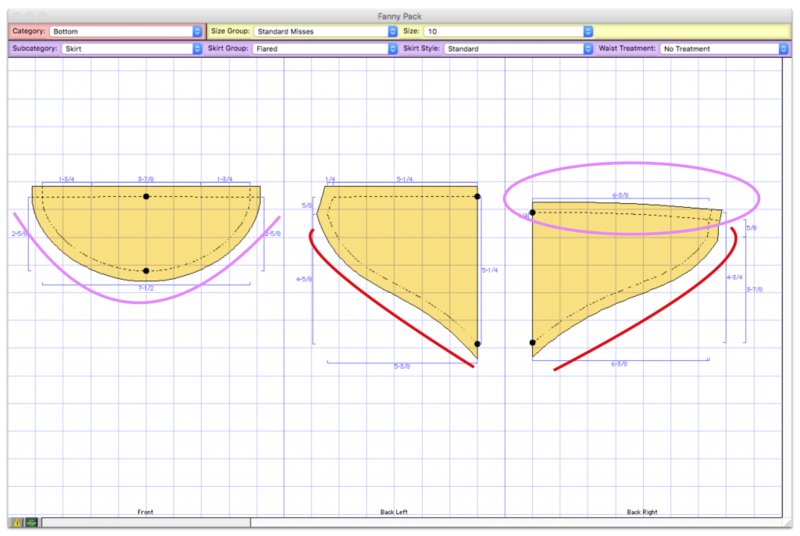 Next I knew I had to match the front pouch pattern top to the measurements of the curved part of the top of the pouch (highlighted in pink below) but I needed to keep the seams highlighted in red the same measurement as much as I could. Which is why I stretched the outermost point of my front pouch piece outwards first to match the semicircular top pouch piece (pink). Then adjusted the same point downwards and adjusted the curves to match the measurement of my back pouch pattern piece again (red). Also, to do this without effecting the back piece, I needed to turn left/right symmetry off by just disabling symmetry altogether… Did you know you can do this by just clicking on the green ‘S’ at the bottom left of your window? See how it is not highlighted anymore? You can also double click it to bring up your symmetry options 😀 and that was that! I made my adjustments and my pattern was complete. 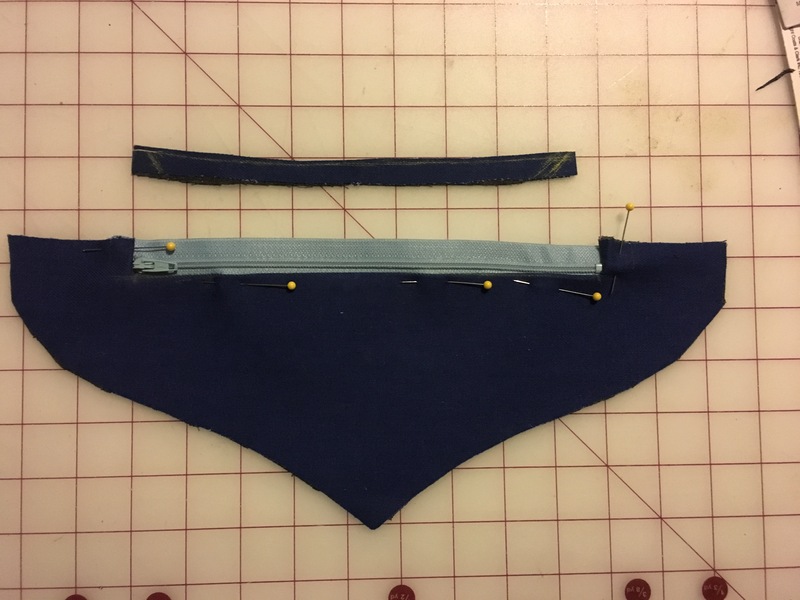 The pattern has a 3/8 seam allowance, so I had to take off 1/2 to insert my exposed zipper onto my front pouch piece. I sewed this to the top of the pouch, then the back piece(which I had already added piping to) to both sewn pieces and turned. 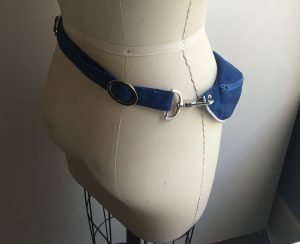 Then I add ed a couple 00 grommets, made a waist strap to attach to my hardware and it was complete! Hands free is the way to be! I was happy to have a fanny pack instead of carrying around a purse, especially in a crowded venue. Just pick one or two shortcuts to focus on during a project and soon you will learn all your favorites! 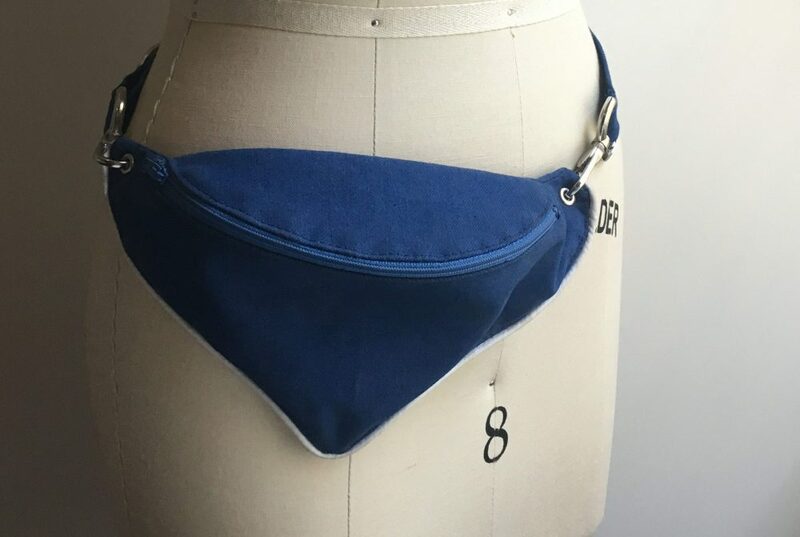 I’ve included my fanny pack pattern in an 8.5 x 11 .pdf file below, enjoy!